Oh yea. Peanut. Butter. Muscle. Brownie. The generous folks over at Lenny & Larry’s sent me one of these treats to try, and of COURSE I was excited. 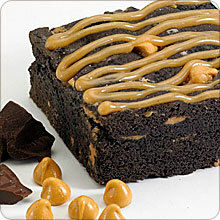 Not only was it a brownie, it was a peanut butter brownie, AND it has TWENTY GRAMS of protein per 80 gram brownie!! So, feeling hungry the other day and in the mood for something sweet and savory, I took out this brownie. It was a thick and rich brownie, with a decent layer of a peanut butter drizzle on top. Some actually stuck to my wrapper a little bit, but no worries! I took a bite, and… These are GOOD! Very sweet, fudgy, dense, and moist. Just delicious! The brownie part was actually a bit too sweet, but still very good. The best part was the peanut butter topping- creamy, sweet and delicious. This gets 4 stars from me. It was very good, but there are two servings in a 2.82 ounce package, with 170 calories and 6 grams of fat per serving. This brownie is too delicious not to eat the whole thing at once! I also wish that there was more fiber, and less sugar. There is only 1 gram of fiber, and 12 grams of sugar per serving. On the bright side, I did like how it was filling, and certainly scrumptious. I can see myself using this as an on-the-go snack or mini meal for when I’m hungry but don’t have time to sit down and eat. 1.41 ounces (40 grams) is 170 calories, 6 grams of fat, 19 grams of carbohydrates, 1 gram of fiber, 12 grams of sugar and 10 grams of protein. Oatmeal! While I love a good bowl of home-made rolled oats in the morning, there are times when instant oatmeal hits the spot. It’s often much faster/easier to make (quicker clean-up, too!) and often has tasty flavors! 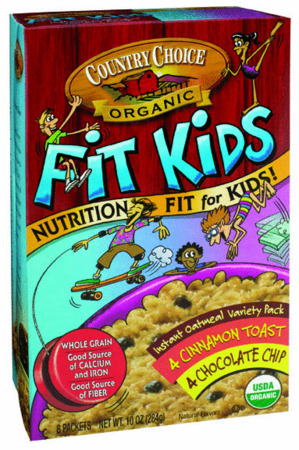 Country Choice Organic sent me some of their instant oatmeal from the Fit Kids line, like the Chocolate Chip and Cinnamon Toast flavors. Yes- Chocolate Chip and Cinnamon Toast! I was SO excited to try these- they sounded like dessert for breakfast! Overall, I do like that these are all natural, have 3 grams of fiber per packet, but they just aren’t sweet enough for my preferences as is. However, I found with a little bit of stevia to sweeten it, and some mixins like fruit, these were actually quite good! 1 packet ranges from 130-150 calories, 1.5-2.5 grams of fat, 26-28 grams of carbohydrates, 3 grams of fiber, 11-13 grams of sugar, and 4 grams of protein. 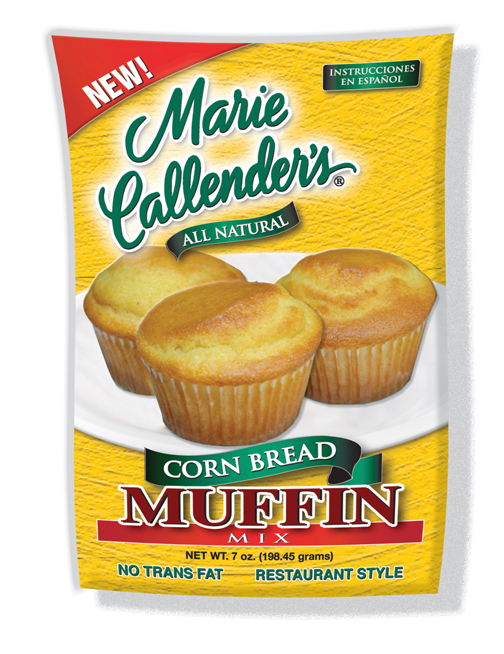 Along with the tasty Biscuit Mix I was sent to try from Marie Callender’s, I was also given the All Natural Corn Bread Muffin Mix in the 7oz variety. Now I was excited for these. I LOOOVEE corn bread, and really rarely get to eat it! I love how it’s moist and super tasty with a little smear of butter. Delicious. So, I preheated my oven to 375 degrees Fahrenheit, and starting making this mix. I decided to go for the swaps suggested on the back of the mix “to make a healthier version”, and switched 1/4 cup applesauce for 1/4 cup oil, 1/4 cup skim milk for 1/4 cup milk, and 2 egg whites for 1 whole egg, and mixed them together. Then I added the corn bread muffin mix to the bowl, which mixed very easily. Hardly any lumps whatsoever! Then I sprayed my muffin tin with some noncook spray and added the muffin mix. I cooked it for about 16 or 17 minutes, and let it cool slightly. These muffins were moist and soft, which was a plus for me. They were mildly sweet as well. I do prefer my cornbread to be a bit sweeter, and I sort of wish they used honey over sugar since I prefer a honey taste as well. They also had a bit of a tang to them, that I couldn’t quite put my finger on what it was. Not super noticeable, but it had a bit of a tangy aftertaste. By themselves, I would assign this to be a 3 star rating, but after I put a little butter on one, I liked it more, which would bring these muffins up to a 3 1/2 star rating. I did like that they were cute medium sized muffins, but didn’t like that they had 0 grams of fiber in the mix, and that the first ingredient was sugar. 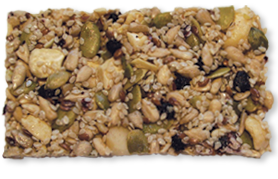 Raw Crunch Bars seem totally cool to me, and are unlike other products I have tried in the past. According to the wrapper, these bars are “Handmade, Uncooked, Unprocessed” and are also “Gluten Free, Dairy Free, Peanut Free”. That’s a lot to offer for one bar, and certainly intriguing. On the other hand, the Raw Crunch Bar with Organic Blueberries, there was a LOT more blueberries! Sweet and small, they sort of reminded me of the type of blueberries that are in blueberry muffins or pancakes. Not plump and juicy, but small and sweet. Overall, I give these both 4 stars. I love that one bar has only 10 grams of carbohydrates, with 3 grams of fiber and 5 grams of protein. A really satisfying snack! 1 bar (28 grams) is 150 calories, 10 grams of fat, 10 grams of carbohydrates, 3 grams of fiber, 5 grams of sugar, and 5 grams of protein. We all know (or hopefully know) how much I looooove yogurt! It’s my healthy and usually sweet treat I make sure I eat everyday! Along with regular yogurt, I also enjoy greek yogurt. 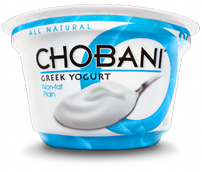 Although I normally go for flavored ones, Chobani sent me their 0% Plain Greek Yogurt to try. The first thing I noticed was that a 6 oz cup is ONLY 100 calories, and 18 grams of protein! I was immediately impressed by that, since I’m not a big meat eater and need dairy/soy/eggs for my main sources of protein. PLus, that is very LEAN protein! No fat, and only 100 calories! Nice! The texture was super thick and creamy, just like I like it. Unfortunately, I do not really enjoy greek yogurt plain. I did try some of this without anything mixed in or added, and found it rather tart for my likings. So, what could I mix with this? Well, I took some regular chocolate frozen yogurt and mixed it with the greek yogurt and let it freeze for a bit in the freezer. Voila! 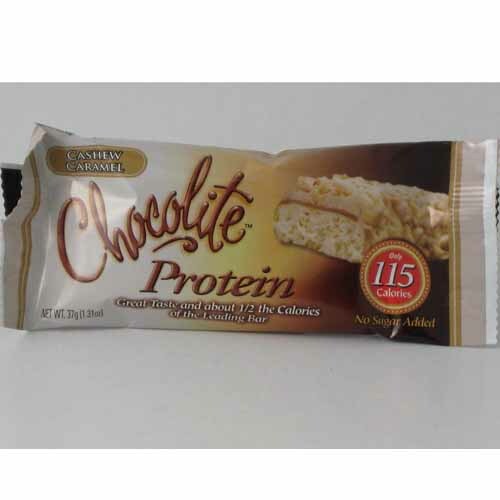 Yummy chocolate taste, and a boost of protein, with an additional creamier texture. Overall, I give this 4 stars. Although I would probably never eat it as is, I can always mix something in to sweeten it. I have in the past also used those ranch seasoning powder mixes with plain greek yogurt instead of sour cream, and found that to be an excellent swap. 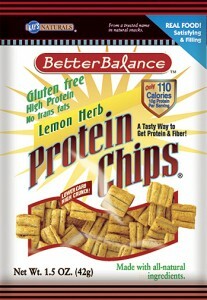 I love that this is high in protein, low in calories, has 0 grams of fat per 6 ounce serving. 1 6oz yogurt is 100 calories, 0 grams of fat, 7 grams of carbohydrates, 0 grams of fiber, 7 grams of sugar, and 18 grams of protein. 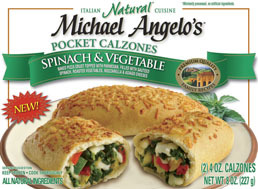 Michael Angelo’s provided me with some coupons to try some free products, and one of them I chose was the Spinach Vegetable Pocket Calzone. These type of frozen foods are my favorite- yummy insides, doughy crust- count me in! This “pocket calzone” wasn’t round as I had sort of expected, but rather long and in the shape of a rectangle. I decided to microwave and then put in the toaster oven for a minute or so to crisp up the outside. After letting cool, I cut open a piece, and was pleased! This was actually quite tasty! The crust was crispy yet chewy, and sort of reminded me of the ends of pizza crust. The inside was very flavorful.It had a cheesy, oniony and garlicy flavor mostly, with a very slight hint of spice. The spinach and the zucchini were a little chewy for my likings, but not bad. It sort of reminded me of a vegetable pizza, but without a tomato sauce. 1 Pocket Calzone is 220 calories, 6 grams of fat, 30 grams of carbohydrates, 1 gram of fiber, 3 grams of sugar, and 11 grams of protein. Organic Hard Wheat Flour, Water, Fire Roasted Vegetables (red bell peppers, yellow bell peppers, yellow squash, zucchini), Spinach, Asiago Cheese (cultured milk, enzymes, salt), Mozzarella Cheese (pasteurized milk, cheese culture, salt, enzymes). Tomatoes-Roasted (tomatoes, canola oil, garlic, vinegar, salt, herbs, parmesan cheese (pasteurized part-skim cow’s milk, cheese cultures, salt, enzymes), Olive Oil, Turbinado Sugar, Yeast, Salt, Garlic Egg Whites, Spices. As someone who really doesn’t eat meat, I really depend on eggs and dairy to get my protein, as well as soy products like tofu. I love when I find tasty, high protein products that are natural and good for you, too! I got some products from Kay’s Naturals, like the Protein Chips in Lemon Herb flavor.According to the package, these Protein Chips are gluten free, and have 10 grams of protein per serving. I’ll be honest, I was a bit reluctant to try this flavor. Lemon Herb? It didn’t sound like it was going to be as tasty, but it was! First I was impressed with the portion size. a 1.5 ounce bag (which did have 1.5 servings in it) had a LOT of protein chips!Each chip is sort of in the shape of a rectangle, and has a wave to it. They dont really look identical to the ones depicted on the front. They were light, airy and crispy in texture. The taste was slightly sweet, slightly spicy, and quite salty. I could certainly taste the lemon- it reminded me of a tangy lemon peel or lemon zest, accompanied with a oniony/garlicy flavor. Actually they kind of reminded me of sour cream and onion chips, with a little bit of sweetness from the lemon! 1 ounce (30 grams) is 110 calories, 3.5 grams of fat, 14 grams of carbohydrates, 3 grams of fiber, 0 grams of sugar, and 10 grams of protein. 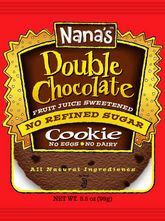 I’ve tried a cookie by Nana’s Cookie Company before, and thought it was great! Well, they also sent me the Double Chocolate Cookie to try, and I was equally as excited. This cookie, is BIG. In fact, One cookie has 2 servings, one serving being 50 grams or half of a cookie. It is a dark brown in color, with pieces of walnuts. I’ll be honest- this cookie was REALLY good. I didn’t miss the eggs or the dairy a bit! =) It was soft, rich, and buttery tasting. I loved how it had a rich chocolate flavor, and was fudgy too. The perfect amount of smeetness! The addition of walnuts also added a really nice touch, and I enjoyed them. Overall, 4 1/2 stars. The only problem in my eyes, is half of a cookie is 210 calories and 10 grams of fat, with only 1 gram of fiber. Something as tasty as this- it’s easy for me to eat half if not the whole thing! Good thing it’s a rather large cookie =) ! 1/2 cookie (50 grams) is 210 calories, 10 grams of fat, 29 grams of carbohydrates, 1 gram of fiber, 13 grams of sugar and 3 grams of protein. Organic Whole Wheat Flour, Fruit Juice (pear, apple, grape), Rice Dextrins (a natural and unmodified starch), Expeller Pressed Canola Oil (GMO Free), Chocolate Chips (whole grain malted barley and corn, unsweetened chocolate, cocoa butter, soy lecithin added as an emulsifier, and pure vanilla), Dutched Cocoa, Walnuts, Baking Powder (non- aluminum), Baking Soda, Natural Flavors, Sea Salt. Nature’s Path is a brand that really has never let me down. I think they make delicious and healthy products, and have a LOT to choose from! I was sent a box of the Whole O’s to try from Nature’s Path. Along with being organic, this cereal is gluten free. I wasn’t really sure what to make of this cereal (before I tried it). There was only 4 grams of sugar per serving, so I wasn’t expecting a sweet cereal, and gluten-free products have sort of been a hit or miss for me. So, according to the box, these were “Crunchy O’s of Organic Corn & Whole Grain Rice”. I opened up the box and saw little brown pieces of cereal, in the shapes of circles. I tried a few by themselves and thought, WOW! I certainly agree that they are “crunchy”! I wasn’t really expecting them to be so crispy and crunchy! They had sort of a toasted flavor to them, and tasted like brown crispy rice cereal. They were airy and had just a bit of sweetness at the end. I tried them in milk next, and was still impressed. I chopped up a granny smith apple and had this cereal with some almond milk and was very happy. 2/3 cup is 110 calories, 1.5 grams of fat, 25 grams of carbohydrates, 3 grams of fiber, 4 grams of sugar, and 2 grams of protein. Organic Brown Rice Flour, Organic Corn Flour, Organic Evaporated Cane Juice, Organic Pomegranate Juice Concentrate, Sea Salt. Health Smart Foods sent me some of the Chocolite products to try a little while ago, including the Caramel Cashew Protein Bar. I cannot even begin to tell you how happy I was when I first bit into this bar. First off, the nutritional stats really rock. One bar has 10 grams of fiber, 115 calories, and only 1 gram of sugar. But the taste is what won me over. The bar itself is dense and chewy, with a thick white coating on the outside, and visible bumps of cashews. The coating tastes like a mix of a buttery sweet white chocolate and a vanilla icing. Smooth and rich and delicious. It did not have an overpowering caramel flavor, which I liked, but was just enough to make it chewy and add a little sweetness. The cashew nuts are crunchy and tasty as well. 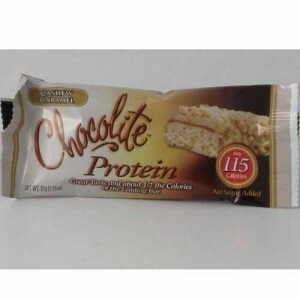 1 bar is 115 calories, 6 grams of fat, 18 grams of carbohydrates, 10 grams of fiber, 1 gram of sugar and 9 grams of protein.